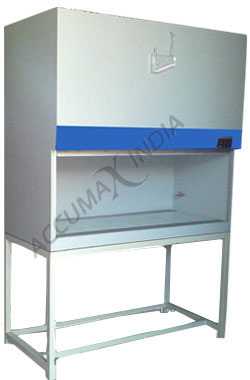 Vertical Laminar Air Flow Cabinet is fabricated using the thick board in Sunmica Clad, Mild Steel Powder Coated and Stainless Steel finish. Further, the system can be made available with different size working benches including in size options of 600mm x 600mm x 600mm, 900mm x 600mm x 600mm, 1200mm x 600mm x 600mm and 1800mm x 600mm x 600mm. The working of these laminar air flow cabinets is also supported by one or two HEPA filters as well as the requirement of working air supply of AC 230V, 50/60Hz.